Camp Ripley, Minnesota, hosts a museum of military artifacts, both Allied and captured enemy equipment. Randy Harvey [HARV] brings us 33 views of the place. Thanks Randy. This is where my dad and his friends trained in the Minnesota National Guard before they all joined USN together in 1939. Perhaps my great uncle trained there before serving with Patton; he did not make it home, falling in the valley with his family name, in early 1945. Thanks! Is this open to the general public? Yes Chris, it's open year round, and national guard trains, theres a museum with exhibits from the late 1800's the second minnesota volunterr infantry and takes you on a historical journey of minnesota's military contributions. I've been there a few times. Thank you for posting these Fred. Back in those days all I did for a camera was buy the disposable ones. So, the pictures aren’t very good. There is a really nice indoor museum there but all of the pictures I took inside were too dark or when I used the flash they were just a fuzzy blur. So all of those ended up in the garbage. Which is the pits because I went through several cameras and took a ton of pictures and would have a lot more to share. But it is a cool place with a ton of exhibits to walk around and enjoy and it is definitely worth the visit. Hi Randy, Thanks for sharing your pictures. I esp like that Dodge Ambulance. Thanks Randy -could you tell me what field gun 11.jpg is? Thanks for sharing Randy. Hope you've been well bud! You're welcome Ko. I'm glad that you like them. I just wish all of the other pictures would have turned out. You're welcome Frank. Glad that you like the pictures. 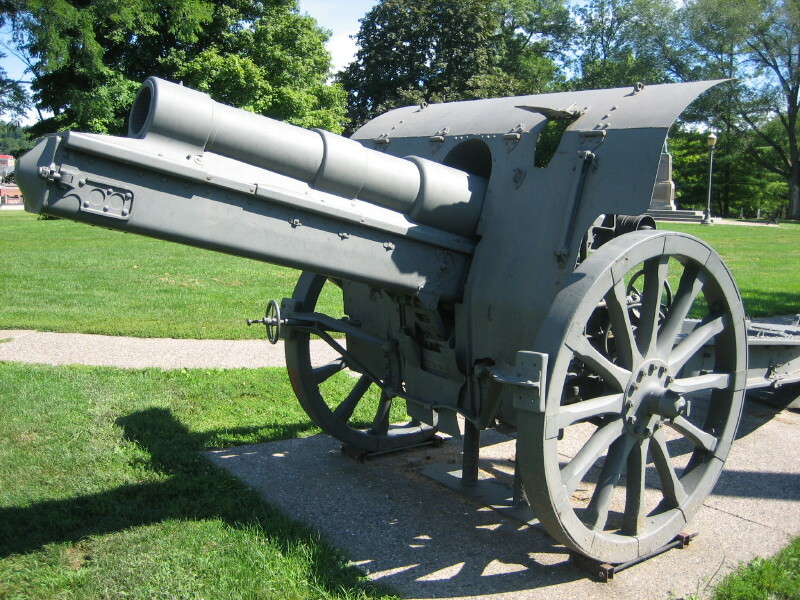 I believe the howitzer is what is left of a German 1913 Krupp Howitzer. But I could be wrong. The shield on the one at Camp Ripley is a little different. And here is a link to a page. You're welcome Pat. I've been alright I guess. Lots of ups and downs, but I guess that's life. Hope that you and the family are all well. Thanks for the nice overview. Spent many a drill weekend there in the 1990's. You're welcome Jacques. Glad that you like them. That's cool that you used to go to drill there. Nice article. When I was in the 4th ID at Ft Carson part of our area of responsibility was the Minn Reserve units. The regular army all had partnerships around the country with the Reserves and the National Guard. So I was at Ripley 3 times as a training adviser and twice attending the winter warfare school they put on there. COLD ! I grew up in the mountains of Penna but I never knew true cold before Minn in January. I got off the C130 on the airfield in the middle of the base and that wind froze the entire breathing system inside me like I just got hit in the chest by a fastball. Good training though and we learned military style cross country and downhill skiing. The night we camped out in arctic tents the mean temp went down to about 20 below zero. Now that is cold my friends! In the summer Ripley is right at the headwaters of the mighty Mississippi and loaded with fish and more turtles than I thought possible. Great part of this great country. Thank you for sharing that Jerry. Sounds like a real garden spot in the winter time!! I really do wish that all of the other pictures that I took would have turned out.